WASHINGTON — Lawmakers from both sides of the aisle are pressuring U.S. President Donald Trump to take a tougher line on Moscow after an incident at sea between Ukraine and Russia, which is ratcheting tensions between the two neighbors. 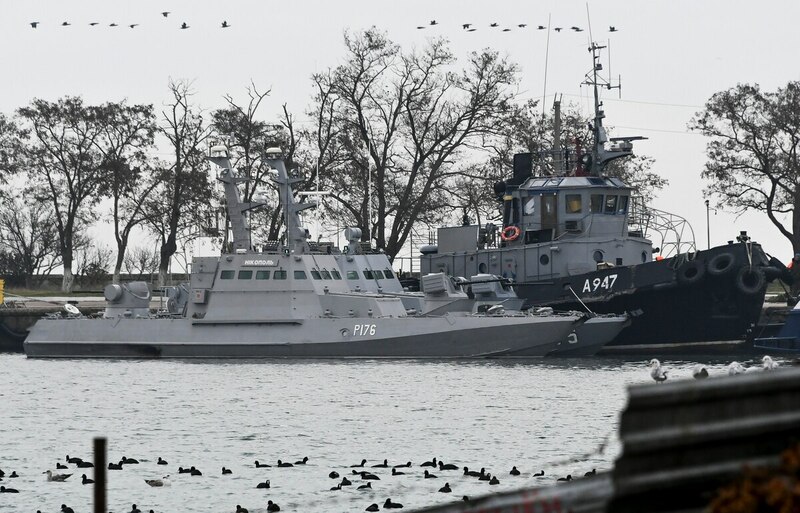 Several lawmakers expressed concerns after the Ukrainian navy said Russian ships fired on and seized three of its artillery ships Sunday, wounding six Ukrainian crew members. Russia also closed the Kerch Strait, a key waterway between the Azov Sea and Black Sea, placing the two countries the closest they’ve been to open conflict since Moscow annexed Crimea from Ukraine in 2014. The incident suggests U.S. and European actions have failed to deter Russian aggression and raised the question whether Trump will attempt to rally allies. How things got this bad, and what could happen next. As the conflict unfolded on Sunday, Trump hit European partners with a Twitter attack over NATO burden-sharing: “The European Union, for many years, has taken advantage of us on Trade, and then they don’t live up to their Military commitment through NATO. Things must change fast!" On Monday, the House Foreign Affairs Committee’s ranking member, Rep. Eliot Engel, D-N.Y., said Trump was sending the wrong message, that NATO is divided and unwilling to react, just as Russian President Vladimir Putin is testing its resolve. Engel, likely to become the committee chairman when the House comes under Democratic control in January, called for a unified and forceful response from the U.S. and its allies, short of war. Engel also repeated his support for sending Ukraine defensive weaponry, which could make Putin reconsider engaging in aggression. “If Putin starts seeing Russian soldier fatalities, that changes his equation,” Engel said. U.S. President Donald Trump said in a statement he reserves the right to ignore the defense authorization law’s ban on U.S. recognition of Russian sovereignty over Crimea, among 50 other provisions. Spain and Germany on Monday joined European Union calls on Russia to release Ukrainian sailors and ships, while U.S. Ambassador Nikki Haley — during a United Nations Security Council meeting Monday — called on Russia to “immediately cease its unlawful conduct” in the Black Sea. Senate Armed Services Committee chairman Jim Inhofe, R-Okla., threatened new sanctions on Russia, and called for a coordinated response between the U.S. and its European allies. “If Putin continues his Black Sea bullying, the United States and Europe must consider imposing additional sanctions on Russia, inserting a greater U.S. and NATO presence in the Black Sea region and increasing military assistance for Ukraine, as called for in the [2018 defense policy law],” Inhofe said in a statement Monday. Congress authorized the government to provide Ukraine with air defense and coastal defense radars, naval mine and countermine capabilities, and littoral-zone and coastal defense vessels as part of the 2018 defense policy bill. That legislation was a response to Ukraine losing two-thirds of its naval fleet, which mostly was based in Sevastopol when Russia annexed Crimea. Ukraine has approximately 71 combat aircraft — older Su-27s and MiG-29s, according to the “Military Balance 2018” of the International Institute for Strategic Studies — and no modern air defense system it might have used to contest Russian actions over the Kerch strait. Its navy is less equipped — one frigate, 10 other surface combatants — and in no shape to challenge Russian dominance of Kerch. The U.S. and Ukraine were in “close discussion” for Washington to supply another tranche of lethal weapons for Kiev’s fight in eastern Ukraine, Ukrainian Foreign Minister Pavlo Klimkin told reporters Nov. 18, a day after Klimko met with U.S. Secretary of State Mike Pompeo in Washington. The Senate Foreign Relations Committee’s ranking member, Bob Menendez, D-N.J., in a statement on Monday urged Trump to commit to strong actions before the president meets with Putin at the G20 summit this week. “Once again, the Kremlin has shown that it only respects a strong adversary that is willing to stand up to bullies,” Menendez said. Menendez also warned the president against a repeat of his display at the U.S.-Russia summit in July, where Trump embraced Putin’s assertion that Russia did not interfere in the 2016 U.S. presidential election, over the analysis of U.S. intelligence agencies and his national security advisers. “At this precarious time, the U.S. cannot afford a weak performance by President Trump at the G20, like we saw in Helsinki. Mr. President this is your opportunity to finally show American leadership in defense of our principles and our close allies across Europe,” Menendez said. Portman credited the administration for authorizing the use of lethal aid and facilitating the transfer of two excess Coast Guard patrol boats to the Ukrainian navy.